Hello July 1st! Summer is in full swing now, and I am really enjoying getting up at 6:30 or 7 and knowing that I've already slept in for hours. Awesome! I am also loving running in the morning, not in the dark, during times that I would normally have to be at school. This change is so refreshing and liberating. Sweaty Mess 6 miler this morning - holy humid! And I am loving spending all of this time with my kids. What I haven't really liked is that my ITB hasn't been very happy with me. And now the arch of my foot has been sore. I am seeing my chiropractor weekly now. And I'm less than a month away from my first 50k. Miles run: 120 (Ward had 119! Woohoo! I beat him.) - lower mileage, but I'm not going to push it! Miles biked: 118 (I am really loving my bikes - indoor and road) - probably my highest mileage biking ever! Maybe I'll be a cyclist instead. Just kidding. # of times I quit running: 1 - Saturday. I set out for a 20+ mile run, got to 7.5 miles and couldn't take another step. Thankfully I listened to Ward and brought my phone along. The crappy part of that is I called him 14 times before he finally answered the phone. When I had quit running, I turned around and started walking/hobbling back to the entrance of the rail trail. I cried the entire way. I was only moments away from throwing myself on the ground to kick and scream like a toddler. Yeah, I'm super mature sometimes. I held back because there were other runners out there that morning. When I told Ward about my traumatic experience, his response was "it's only running". Men! I'm looking forward to being smart in my training, focusing on my abs, strength training, completing my first mud obstacle course, and completing my first ultra! 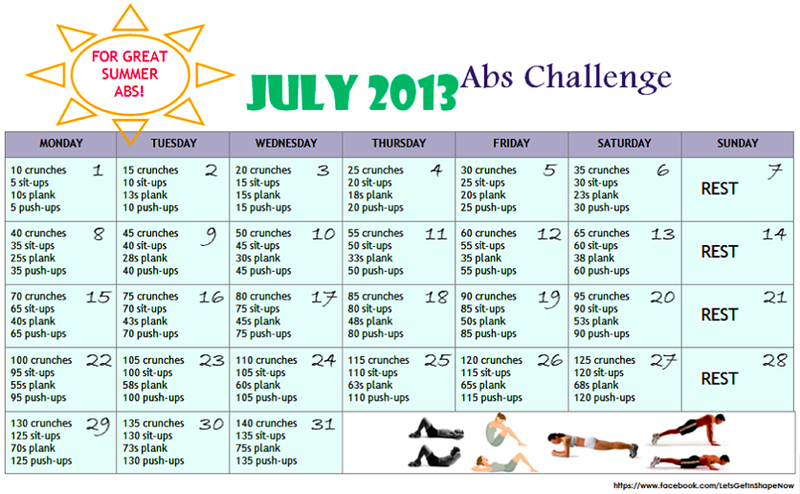 If you are looking for an Abs Challenge - here's a great one to start with! I'm doing it. 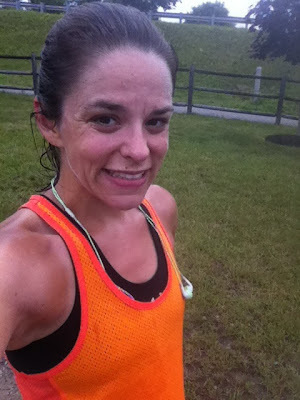 Have you done a Dirty Girl run yet? If you live in the New England area or would love to visit Massachusetts in a couple of weeks. July 13th to be exact. I have a 20% discount code for you to use at Dirty Girl Boston (which is really at Amesbury Sports Park) - DGBOSBLOGGUEST. I promise it's going to be fun! And muddy! Two weeks after I get muddy, I'm going to run my first ever 50k, which coincidentally will be the last year this ultra marathon will be held. 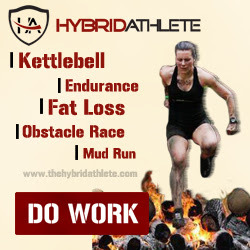 Disclaimer: I am an affiliate for Hybrid Athlete. I am not required to give you a positive review and as always, all opinions on my blog are 100% my own. LOL - I'm mature sometimes too. There were a couple of horribly hot, just bad bad bad runs last summer where I literally stopped and basically stomped my foot that I was done. Jason was with me and he had to talk me off my ledge. We had to get home one way or the other pretty much. Sounds like plantar fasciitis might be creeping up on you. Be sure to stretch your foot, ice it, roll it on a tennis ball or golf ball and roll out your calves. But awesome job on your miles!! How excellent you are doing strength training for your obstacle race! Can't wait to hear what you think of the program. On Friday, I finished my 19 mile run (was supposed to be 20) and I went into the garage, laid on the ground and cried for 10 minutes. I was frustrated I didn't finish, I was frustrated with my pace, I was tired, so I cried. Unfortunately, I was up in Maine at training camp with my coach and not my husband so my crying fit was seen by my coach and not my hubby. Ugh. So I feel your pain on that trail! Jen you will be back at it soon and at higher quality than you were before, because of all the cross-training you are doing. I LOVE running when I should be in work! It's like I'm skipping school!!! Awesome! I always say to my hubby...if you don't pick up when I call that could be the one phone call I could get out in an emergency!!! I'm in for the abs challenge! I actually had quit triathlons the day that Mike crashed his bike... That's why he was going back to the car and then flipped over, so fun times for me. Great job getting more miles than Ward this month and you are doing great on the bike! Great job on your mileage and for beating Ward! That's awesome! 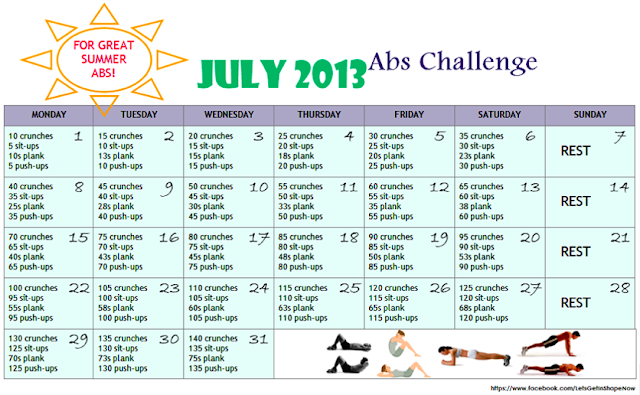 I'm doing the ab challenge too. I'm sure by the end my abs will thank me! Awesome goals for July! So exciting about your mud run and your Ultra!!!! Wowza! 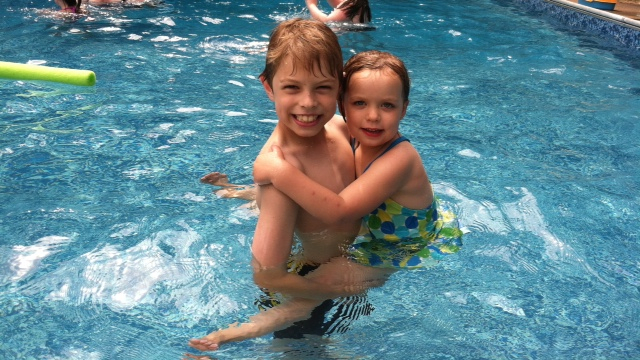 Happy to hear how much you are enjoying your summer thus far!